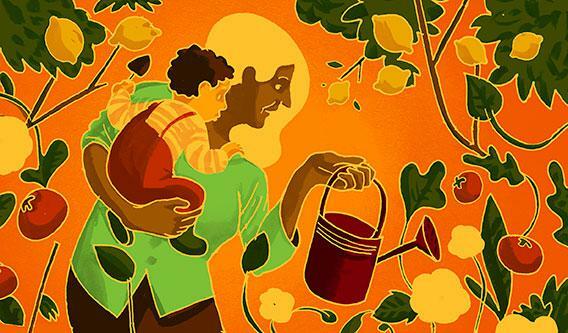 Mothers and gardening: A daughter remembers her mother’s green thumb. A mother, a daughter, and a garden. This essay is reprinted from What My Mother Gave Me: Thirty-one Women on the Gifts That Mattered Most, edited by Elizabeth Benedict and out April 2 from Algonquin Books. I was raised in a greenhouse. My mother, born of Iraqi Jews who had migrated to India, married a Canadian who brought her home to a glass house in Ottawa. As a toddler, I barely noticed that most of the house was made of windows, but it wasn’t me paying the heating bills. What I did notice was that every window was always and forever mounded with plants. Delicate African violets and cactuses bloomed, and avocado trees stood sentry over the living room. They must all have been as baffled by the endless Canadian winters as my mother. But more pressing in my memory, we were running a plant infirmary at my house, in which root tipping, stem reinforcing, and plant healing happened in tiny glass jars and chipped mugs on every windowsill. It was as if my brothers and I had a whole host of plant half-siblings guiding us through our childhoods, hopping along on their little plant wheelchairs and slings and crutches. But then came the plant she gave me when my first son was being born. A painful and violent labor turned into a painful and violent delivery and then got worse. It was going so badly that when my parents left the hospital the first night, my mother tore the printed message off the top of the little card they’d stuck in the plant at the hospital gift shop that had read “Welcome new baby” or some such. A joyous welcome was no longer certain. A few hours later, soon after Coby emerged, I saw a new, flowering plant by my bed and only the torn bottom half of a card. I took out the worst of my postpartum derangement syndrome on that poor plant. I couldn’t help but wonder how my mother imagined I could take care of a tiny white flowering plant over and above the colicky, deranged, sleepless bucket-of-hair that came out of me crying and couldn’t stop for three-and-a-half months (but who’s counting?). I wanted to drown that plant. Taking care of it was too much to ask of me. My son did stop crying, but only after my mother sat up rocking him all night long, so my husband and I could sleep for a few hours and not phone the divorce attorneys. Eight-and-a-half years later, the plant still blooms in an upstairs dormer window. I forget to water it and it lives, I overwater it and it coughs up a lung and then thrives again. Tiny white flowers greet me almost every morning, despite my best efforts to forget it. I once dragged my mother over to the plant and demanded that she explain why it looked so droopy in places. “Yes, they do that,” she said. Even with its perilous beginnings, that plant is the most precious thing my mother has ever given me. Most of what I know about parenting and patience and life I’ve learned by watching it. Of my kids, I now mostly think, “Yes, they do that.” At some point, I asked my mother what this type of plant is called, and she said, “It’s a Grandma Rose plant,” because my grandmother, her mother-in-law, had loved them so much. When my son turned 3, he planted strawberries all over the backyard garden, and they produce similarly tiny white flowers that—I secretly hope, every spring—might just grow into my Grandma Rose. My second son, Sopher, was born without a plant entourage but with a green thumb in his mouth. He started popping seeds into the garden as soon as he could toddle, and the row dedicated to “peas” is still labeled “pesa” because he was 4 and couldn’t spell, and really, shouldn’t they have been called pesa in the first place? Last summer, when he was 5, Sopher and I ended up in Home Depot or Lowe’s or one of those huge wretched “home improvement” stores with no windows anywhere, and he circled four times around a rack of broken, dead, and diseased plants generously described by a sign as “lonely plants” but largely marked by their crypt-like odor. He begged for one. We now have three. He waters them and names them and tells me he is the “plant whisperer,” just like his grandmother. His sunflower grew so big it finally fell over. His tomatoes are still glorious. Even the pesa. I worry that the neighbors will come with shopping bags for the pesa. I watch him out there in wonder. Voltaire famously concluded Candide with the advice, “But let us cultivate our garden.” He understood that there is something about caring for the plant world that makes us more apt to behave well in the human world. One has the notion that things raised in hothouses come out delicate and fragile. But I think the opposite is true: I think they are raised with an understanding of how life runs deep and sure and all around. We consider ourselves a green family. Prius, check. Compost heap, check. But I don’t shiver in anticipation at the thought of splitting tubers or transplanting peonies, as my mother does. She reminds me what it is to be of the earth and to fight for the Earth, not by way of bumper stickers and committee meetings and petitions, but by just planting and tending and weeding and never giving up on even a broken bit of spider plant. I see that in my son now, too—happy with dirt in his green rubber boots and a watering can and a watermelon seed. When I go to visit my parents, my first stop is my mother’s garden. When his lonely plant goes yellow at the edges, my son asks to put in a call to his grandparents. The earth and the garden have rooted us all to one another when nobody was looking. We cultivate our garden and let life take it from there. “The Plant Whisperer” is from What My Mother Gave Me: Thirty-one Women on the Gifts That Mattered Most, edited by Elizabeth Benedict (Algonquin, April 2013). Read more about the book here.